Our trained staff will mow your lawn, fertilize your lawn and plantings and keep a watchful eye for any problems that may arise, i.e. insects and disease, and apply all of the appropriate actions to take care of the situation. 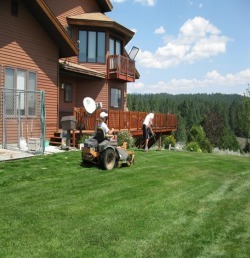 Full or partial maintenance services are available to fit your needs: Mowing, Mulching, Weed Control, Fertilization, Trimming and Pruning Shrubs and Trees, Dethatching, Aeration, Yard Clean Up, Sprinkler Maintenance, Paver Cleaning and Sealing. We can also maintain the sprinkler system for you including Spring Start Up, adjustment of heads, watering times, and Winter Blowout. Spring Clean ups and one time clean ups are available. Also, mowing of tall grass and lot cleanups is available.